A few weeks back, I looked into how I was going to carry around my spare inner tubes and pump on my cyclocross bike, especially after I’ve ended up with two punctures on the cyclocross bike! 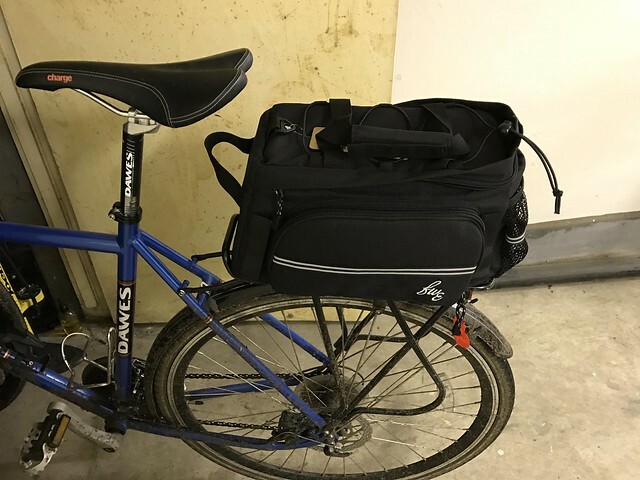 Part of that was to move the Carradice saddlebag I used on my commuter onto the Verenti and to find another solution for the Dawes. In the end, I settled for a rack bag, as I thought that with the rack on there, it made sense to have a bag that didn’t leave the rack. 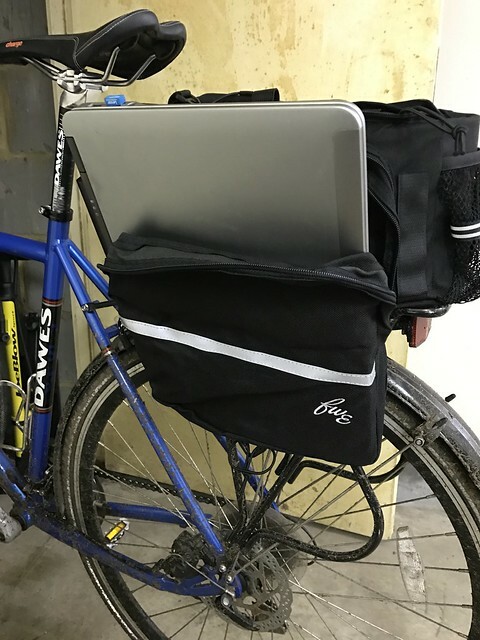 I’d been trying to decide on a bag when I ended up spur of the moment getting one from Evans Cycles whilst I was in there one time - an Evans own brand, FWE Rack Pack. I had been considering either the Carradice Super C Rackbag or the Carradura Rackbag but I think being able to see and feel the bag before purchasing it (and an easy return if it didn’t fit) meant that I went with the Evans one. Fitting it to the Dawes was simple - it just attaches via velcro. Put the straps around the underside of the rack and thread it through the D rings and back under and it’s secure. Movement forward and back shouldn’t be an issue on my rack as the straps are near the supports so should be OK in regards to movement. One of the major downsides I’ve found though is that I can’t use my panniers at the same time. 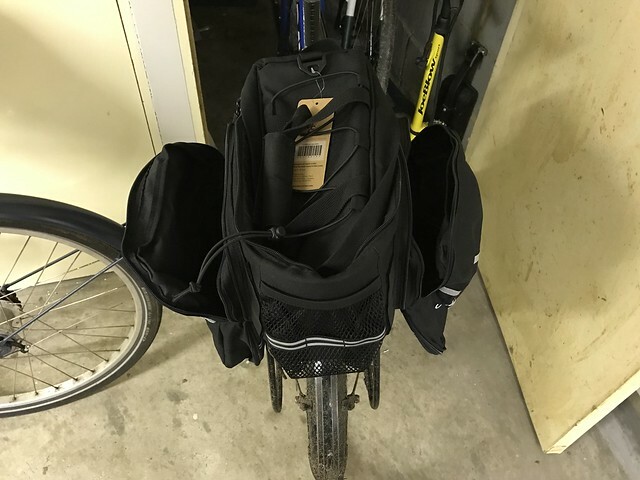 This is because the attachment points for the panniers line up exactly where the velcro mounting strips for the rack bag and therefore they are prevented from attaching. This isn’t the end of the world it would seem - as the sides of the bag are able to fold out and allow you to fill them as panniers as well. However, there are some occasions where this wont be sufficient! My work laptop is to large for the bag and clearly doesn’t fit - it’s not a huge laptop either (a Dell E6440 - 14” laptop) but it does mean that I’m limited as to when I can use it! 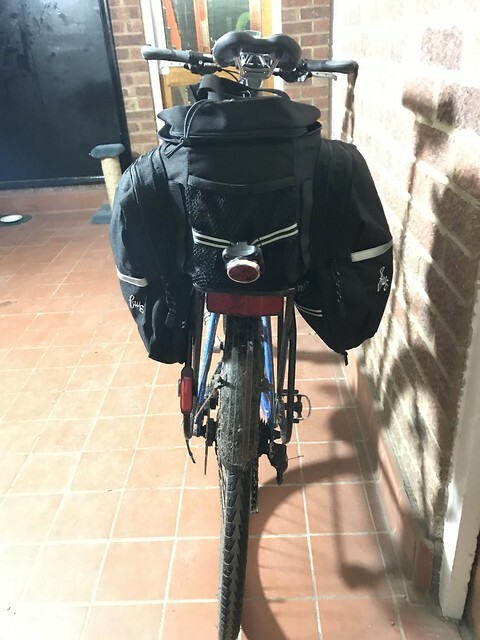 Having cycled to work with this bag instead of my panniers, it made a big difference in terms of noise - cycling with this was silent! Usually there is a degree of rattling from where the panniers attach to the rack but with this one, there was none of that. Space wise, it’s smaller than my usual pannier setup, so I’ve got to be more careful with what I take with me. I can fit a change of clothes, towel and my puncture repair kit, but other than that, I can’t carry much more so I’m not sure where I could pack in a packed lunch!